How much of a price premium are buyers prepared to pay for a well designed property? Design-led estate agency The Modern House had known for years that buyers are prepared to pay over the going rate for beautifully designed homes. 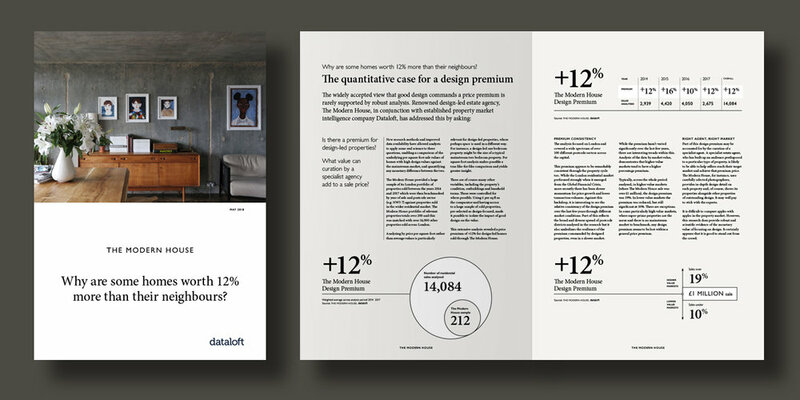 They commissioned Dataloft to measure in qualitative terms exactly how much of a premium homes with high design values can demand. By looking at over 1400 property transactions in over 100 London postcodes, and comparing them on a price per square foot basis to a sample of London sales provided by The Modern House, we found that an average price premium of 12% can be expected for design-led homes. In the upper end of the market (properties valued at £1m+) this premium was as high as 19%, although at the lower end the figure was nearer, a still significant, 10%. This premium seems to be remarkably consistent through property cycles, highlighting the resilience of a design premium, even in a slower market. The research was extensively covered in the national press including The Times, The Evening Standard and The Telegraph.